Fallujah a Turning Point ? Iraqi government forces have retaken most of the city of Falluja from so-called Islamic State fighters who have held it since 2014, officials say. US Defence Secretary Ash Carter said there was "still some fighting to be done" as IS still controls a significant part of the city. But Iraq's prime minister hailed the day's events as a "liberation". A senior army spokesperson said he expects IS to "suffer a total breakdown during the next hours". "The enemy is collapsing. They have lost control of their fighters. They are on the run now," Lt Gen Abdul Ameer al-Shammari said. Special forces commander Brig Haider al-Obedi told AP that his troops controlled 80% of the city. Falluja, only 50km (30 miles) west of Baghdad, has been held by IS for longer than any other city in Iraq or Syria. They captured it in January 2014. Iraqi forces said on Friday that they had retaken Falluja's main government compound as well as southern and eastern areas. They were backed by air strikes from the US-led coalition. A statement said the Iraqi flag was raised above the city council building after its capture by Counter Terrorism Force troops, police and soldiers. The Iraqi Prime Minister, Haider al-Abadi, said only small numbers of militants remained. Speaking on state TV, he said: "We promised to liberate Falluja, and we took it back. Our brave forces went into Falluja and took control of the city centre. "There are still some pockets that need to be cleared in the next few hours". "I directed all the government institutions to mobilise all efforts to help civilians and provide humanitarian aid to them." Mr al-Abadi tweeted that the city had "returned to the nation" and Daesh (another name for Islamic State) would be defeated. He also said Mosul was "the next battle". The northern city has been under IS control since 2014 and the Iraqi army launched an operation in March aiming to retake it. Iraq recaptured the central city of Ramadi from IS in December 2015. IS overran Falluja, a predominantly Sunni Arab area, in January 2014 - six months before it seized control of large parts of northern and western Iraq. 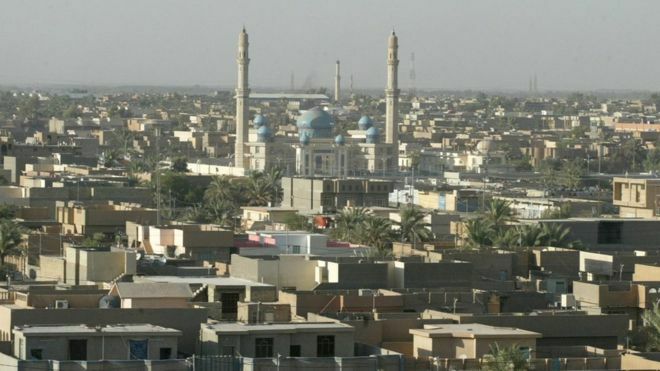 Government forces launched the offensive to take back Falluja almost four weeks ago, after besieging the city and its suburbs for several months. Falluja's capture would represent a significant blow to IS morale, recruitment and funding. Being a mere 50km west of Baghdad, it might also relieve some pressure on the Iraqi capital as well. IS's defeat should equally bolster the morale of the Iraqi forces who after a series of slow but deliberate campaigns - backed up by US and allied air power and advisers - have begun to have some success. However, the military battle is only part of the story. The capture of Falluja will present the Iraqi government with a major test. Can its forces - which include a significant Shia militia element - prevent the mistreatment of local Sunnis? The government needs to show that Sunni and Shia forces can work together. Veteran US analyst Anthony Cordesman says: "Falluja has become a test of whether Iraq can move back towards some form of unity or federalism." Re: Fallujah a Turning Point ? With a bit of luck they all get destroyed before x-mas. You need to pacify that place or else it'll happen again. Wouldn't that be nice ! The Iraqis have a problem with Thier regular army troops .. There's so much resentment and corruption ..... Peace will come at a high cost of human life .. They are already rounding up everybody even remotely associated to Isis and sending them to Bagdad .. Hopefully ,never to be seen again ..
Another form of cleaning .. I'd like to hear this one myself ..
BAGHDAD — A senior Iraqi commander declared that the city of Fallujah was "fully liberated" from ISIS militants on Sunday, after a more than month-long military operation. Iraqi troops have entered the northwestern al-Julan neighborhood, the last area of Fallujah to remain under ISIS control, the head of the counterterrorism forces in the operation, Lt. Gen. Abdul-Wahab al-Saadi, told The Associated Press. Al-Saadi said the operation, which began in late May, "is done and the city is fully liberated." The Iraqi army was backed by U.S.-led coalition airstrikes and paramilitary troops, mostly Shiite militias. "From the center of al-Julan neighborhood, we congratulate the Iraqi people and the commander in chief...and declare that the Fallujah fight is over," he told Iraqi state TV, flanked by military officers and soldiers. Some of the soldiers were shooting in the air, chanting and waving the Iraqi flag. added that troops will start working on removing bombs from the city's streets and buildings. The announcement comes more than a week after Iraqi Prime Minister Haider al-Abadi declared victory in Fallujah after Iraqi forces advanced into the city center and took control of a government complex. While al-Abadi pledged the remaining pockets of IS fighters would be cleared out within hours, fierce clashes on the city's northern and western edges persisted for days. The operation has fueled an exodus of thousands of families, overwhelming camps for the displaced run by the government and aid groups. According to the U.N. Refugee Agency, more than 85,000 people have fled Fallujah and the surrounding area since the offensive began. Like other aid agencies, the UNHCR warned of the dire conditions in the camps, where temperatures are well over 104 Fahrenheit, and shelter is limited, calling for more funds to meet the mounting needs of the displaced. Fallujah has been under the control of ISIS militants since January 2014. Fallujah, which is located in Anbar province about 40 miles west of Baghdad, was the first city to fall to ISIS in January 2014. During an insurgency waged by IS group's militant predecessor, al-Qaeda in Iraq, Fallujah was the scene of some of the bloodiest urban combat with American forces. In 2004, more than 100 U.S. troops died and another 1,000 were wounded fighting insurgents in house-to-house battles. ISIS extremists still control significant areas in northern and western Iraq, including the country's second-largest city of Mosul. The group declared an Islamic caliphate on the territory it holds in Iraq and Syria and at the height of its power was estimated to hold nearly a third of each country. In total, more than 3.3 million Iraqis have fled their homes since IS swept across northern and western Iraq in the summer of 2014, according to U.N. figures. More than 40 percent of the displaced are from Anbar province.